I have just realized that Thursday—Thanksgiving Day—is a fast day and I should not be eating then. I will have to swap it for some other day this week. It was sold at auction by Christie’s in New York to Prince Badr bin Abdullah bin Mohammed Al Farhan on behalf of the Abu Dhabi Department of Culture & Tourism on 15 November 2017, for $450.3 million, setting a new record for most expensive painting ever sold. The painting is to be on display at the Louvre Abu Dhabi but no date has been fixed for its unveiling. See here for the list of the world’s most expensive paintings, especially #2. Those born on this day include: James A. Garfield (1831), Billy Sunday (1862), Tommy Dorsey (1905), Indira Gandhi (1917), Gene Tierney (1920), Roy Campanella (1921), Ann Curry (1956), Jodie Foster (1962; I watched “Contact” on the flight back from Paris and found it a mixed bag), and Shmuley Boteach (1966). Notables who expired on November 19 include the Man in the Iron Mask (1703; read at the link), Franz Schubert (1828), Joe Hill (1915), and Della Reese and Mel Tillis (both on this date last year). Hili: I’m analysing my identity. A: And what’s your conclusion? 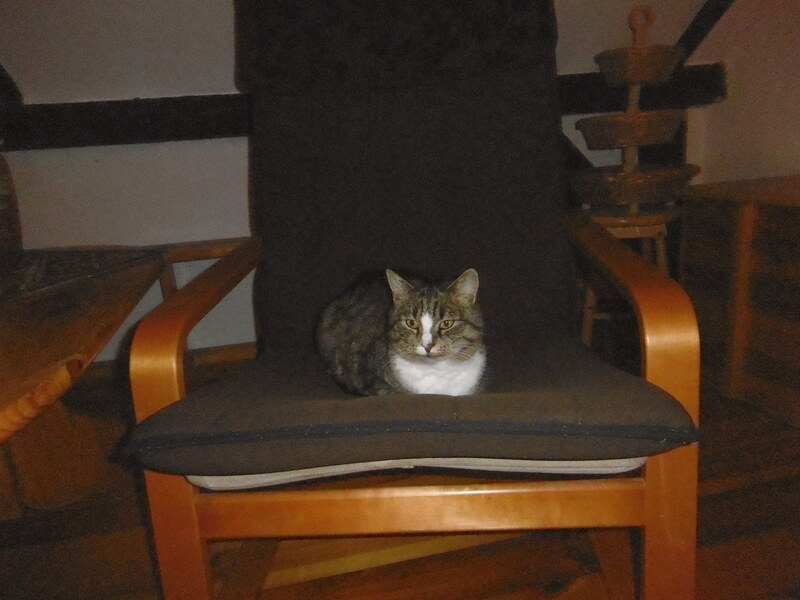 Hili: I’m a full cat who is slowly getting hungry again. Hili: Jestem kotem najedzonym, który powoli staje się głodny. Otters are WAY underrated, and this one is clearly having fun. From reader Gethyn. The man got what he deserved. Tweets from Grania. You’ve seen all of the cryptic beasts in the first tweet before, but it’s time for a refresher. This is a useful list! And . . . one of Matthew’s beloved optical illusions. Try it! This entry was written by whyevolutionistrue and posted on November 19, 2018 at 6:30 am and filed under Hili Dialogue. Bookmark the permalink. Follow any comments here with the RSS feed for this post. Both comments and trackbacks are currently closed. “The Water-Closet Codicil” would’ve been a cool name for an Arthur Conan Doyle “Sherlock Holmes” story. Nothing to do with commas ,but i broke my left wrist a month ago pushing my motorbike and i slipped and and it fell on top of me,waiting in the A&E dept i noticed a sign . Did take a photo ,but my phone won’t let me transfer it to my laptop. You get the same kind of effect with hashtag messages: over here in the UK there was a recent advert in which a bunch of ostriches learned to fly, and the slogan was ‘do what you can’t’. The hashtag said dowhatyoucant, which sounds like an expression of incredulity in ‘cockney gangster-ese’. David, I’m not sure what your objection to that sign is. An inpatient is a patient who stays in the hospital while under treatment. It does not refer to someone who lacks patience. That would be impatient, with an m.
Not objecting to it ,but it is normally two separate words “In Patient “. Just had a look on the interweb ,and it is just one word ,well i never . By the way my wrist is still painful sometimes ,due to have the cast off on the 29th of Nov .
Any bone Doctors out there ,should it still be painful after a month ? My wife broke her ulna last year. She was in pain (not severe) the entire time while wearing the cast and even after the cast was off for a couple weeks. She thinks the nurse/assistant didn’t put her cast on correctly, but I have no way of knowing that. Either way, I don’t think its abnormal to still be feeling some pain. Thanks for the reply ,can’t wait to get the plaster off ,got things to do . Hi ,that’s for that ,i will give a try . Hi ,thanks for the tip ,managed to install it . I watched “Contact” on the flight back from Paris and found it a mixed bag. Coulda done without the McConaughey character. Thought the versatile character actor William Fichtner gave a great turn as the blind radio-astronomer, though. I read the book. It was good, but not great. And I must’ve seen the film because I have a memory of the scene where the transporter drops and she meets the ETs. I think if we did ever meet aliens they probably _would_ have to dumb themselves down for us, given how extraordinarily advanced they would be. So that scene made sense. And I liked the fact that the journey is instantaneous to outside observers. But I also like a bit of ambiguity and mystery in my sci-fi films. It was all a bit workmanlike. Yeah, his religious blather dumbed the movie down while trying to be profound. I mostly agree but there had to be a love connection to make it more appealing to a wider audience. Sagan’s widow had a big part in the screen play and I’m know that she made sure that Jodie Foster didn’t kow tow to religion. The same umbrella girl with the ‘beast’ as on the modified Starbuck cup. What is it? The Van Gogh optical illusion is a bit like dropping acid. Not that I would know. If you have not seen “Loving Vincent”, I highly recommend it. 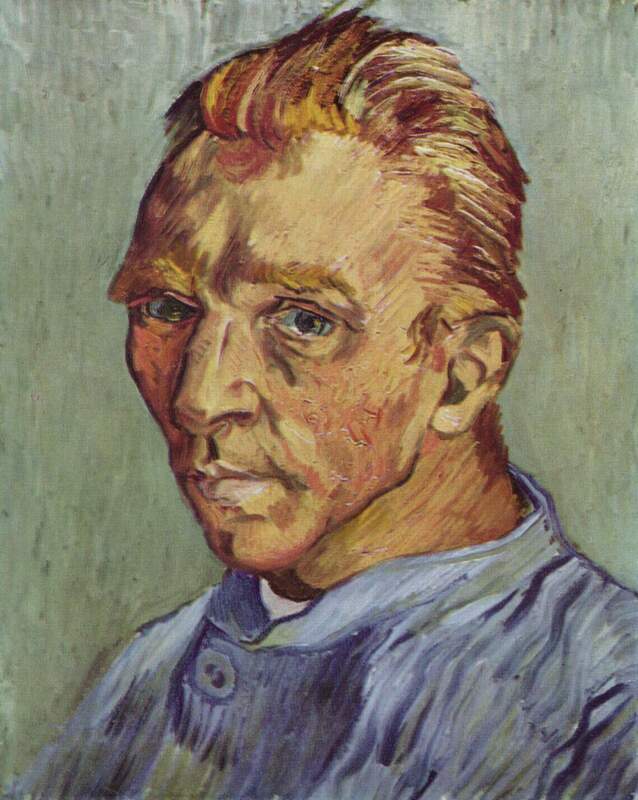 And to get you in the mood, Vincent from Don McLean. Loving Vincent was spectacular, in all senses of the word. An incredible illusion. A few of Matthew’s recent illusions have been a bit underwhelming but this one was amazing. The Starry Night illusion is amazing. I am assuming it is the saccades induced in one’s eyes after viewing the moving spiral. My impression of Ocasio-Cortez is that she certainly has much to learn and will undoubtedly make naive mistakes on the national stage, but she is earnest and authentic in her desire to serve. She is clearly very bright and not at all comparable with the odious grifter Sarah Palin. Ocasio-Cortez is someone capable of learning from her errors. I’m not even sure what “errors” she’s made, not even having taken her place in the House yet. Promoting health care, child care, the environment, jobs, and such issues, certainly has engendered vitriol, though. She won the primary over an old-style, Tammany Hall type Dem politician, in Joe Crowley, by running on issues that her district cared about. The tweet on her bank account echoes the ridicule she received on Fox News for having difficulty finding an apartment in D.C. that she could afford. Yes. For decades there have been complaints about elitist politicians whose wealth makes them out of touch with the poorest people in society. And there was a lot of sneering from the right about Bernie Sanders owning a nice house and thus being a hypocrite. Same thing happened over here with that arch Anti-semite Jeremy Corbyn . Both the right and the center piled onto Ocasio-Cortez for claiming that the unemployment rate is low because many people have two jobs. A single mistake and a democratic socialist is doomed in our double standard world of false equivalences. It’s not a single mistake. Did anyone read my post citing multiple left wing sources, including the Washington Post, calling out Ocasio-Cortez for MULTIPLE misstatements and errors? She apparently has overwhelming charisma. She is enchanting people. Many of the artists who’s works now sell for megabucks were dirt poor or at least not wealthy throughout their careers. When I see these fabulous prices I wonder what they would think about it? Also, what would be the effect if they could have brought these uber prices during there lives. The money would have relieved stress and worry, but might have stifled creativity. It was my understanding that Mohammed bin Salman bought Salvator Mundi. But checking just now I find this from the Guardian https://www.theguardian.com/artanddesign/2017/dec/07/world-record-da-vinci-painting-to-be-exhibited-at-louvre-abu-dhabi apparently quashing that rumor. I say apparently, because I am not convinced. In any event, I find it passing strange that these Arabs spend fantastic amounts of money to acquire paintings of the Second Person of the Holy Trinity. I know that Jesus is a prophet in Islam, but “Salvator Mundi” – that’s more like a title for the 12th Imam. Associate professor of economics of the neoliberal, nihilist, hedonist, immoralist, atheist, sodomitic, asocial, atomistic, introvert & ballet-loving kind. Who can beat that? http://www.dictionaryofobscuresorrows.com/, and will be published soon by Simon & Schuster. I’m neither a neoliberal or sodomitic, but Professor Berggren has a very interesting and thought provoking twitter account. OK, I have experienced vellichor and ellipsism. 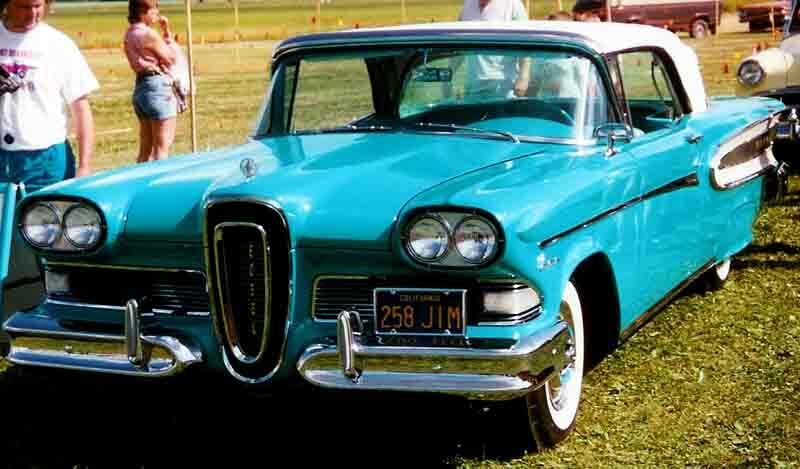 That’s a ’58 Edsel in the pic. My first automotive heartthrob was a ’58 convertible. The little-known and rarely-seen 1960 models that had only been in production for about 2mos when the line was killed off, were to my eye the most handsome of all of FoMoCo’s offerings that year, or from anyone else for that matter. And that Starbuck’s cup is fantastic! The English language seems deficient in words describing complex emotions. The German language does much better, probably because compound words are more common in German. Starbucks does serve some rather overly sweet Machiatto’s primarily a Caramel one, but also serves some perfectly plain ones without “enhancements”.